How and when did you first get involved with art? 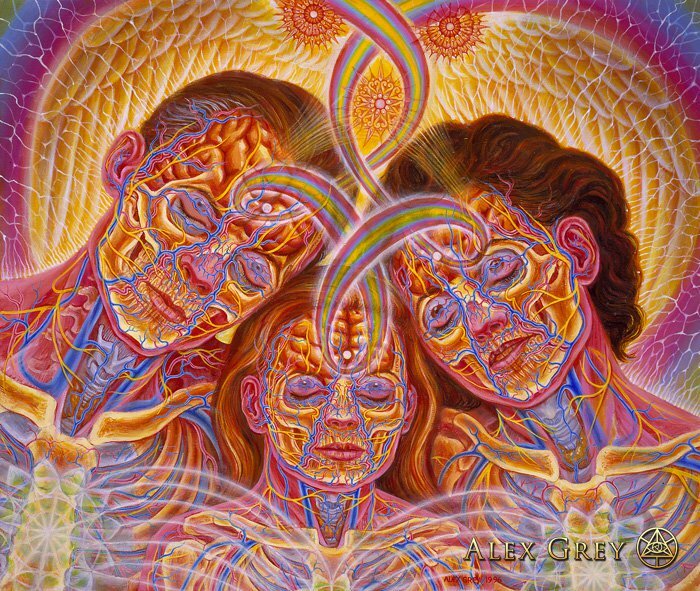 Alex Grey : Allyson and I have always been artists. We met in art school in 1974 and have shared a studio for 38 years. Were you always interested in visionary-style art? Have you ever practiced any other styles of art? 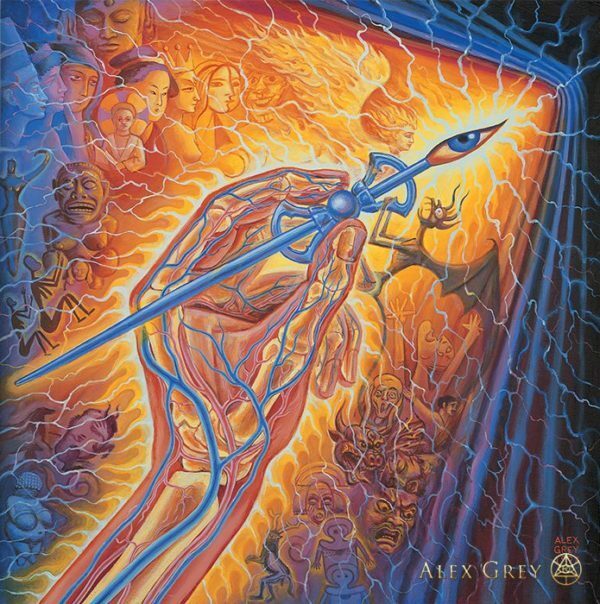 Alex: Writing about my first book, Sacred Mirrors: The Visionary Art of Alex Grey [Inner Traditions, 1990], James Oroc, [author,Tryptamine Palace, 2009], writes: "The sub-title of this book [Sacred Mirrors: The Visionary Art of Alex Grey] is now believed to be one of the key influences in the naming of a new genre now known as visionary art." In my second book, The Mission of Art [Shambhala, Grey, A., 1998] I define visionary art as: "... the creative expression of glimpses into the sacred unconsciousness… the mystical experience of spiritual illumination, unity, wisdom, and love." My art never attempts to portray a style. My art is performative and based on inner visions portrayed from observation to my best ability. Allyson and I are performance artists and social sculptors. 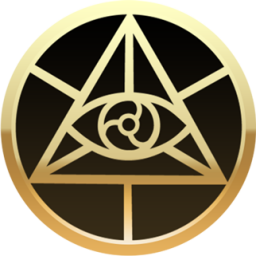 CoSM is our artistic co-creation with our global community. What are some key differences between visionary art and other styles? What makes the Visionary Arts Fair different from a regular art show? Alex: Walter Hopps, an imminent art curator and writer said that their are three broad categories of art: realist, abstract and imaginal. Realistic art attempts to represent the natural world. Abstract art is non-representational and can also come from visions. Sacred Geometry, patterning and all forms not referential or literal to the natural world would fit into this category. Imaginal art has been referred to as Visionary Art, images seen in the creative imagination. Cave paintings of human/animal hybrids, a shamanic figure with stag antlers and tail, all show the ancient lineage of Visionary Art. Religious Art is related to a sacred tradition. Since visionary experiences of enlightenment and stories of God-contact are the foundation of all world religions, much of sacred art refers to these transcendent moments, such as Moses and the burning bush or Buddha dispelling Mara's demons. 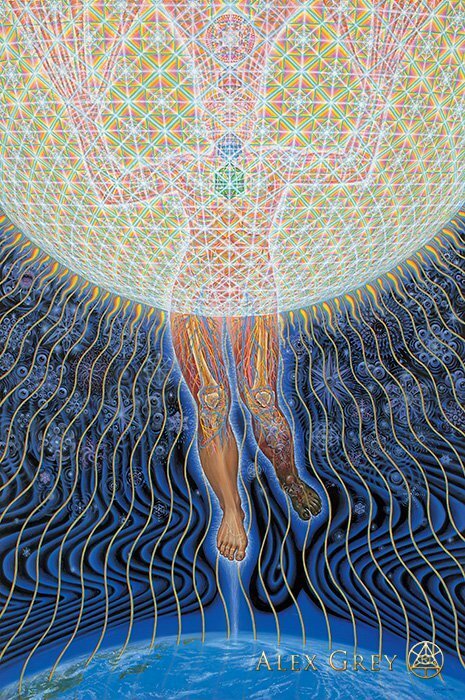 Another feature of Visionary Art is ornate geometric patterns of interconnectedness, and you will find unique expressions of these interweaving latticeworks in many temples throughout the world. Psychedelic art often reflects the bright intense light, rainbow hues, iridescence, patterns of infinite interconnectedness, forms metamorphosing, one being becoming another, infinite vistas, interpenetrating dimensions… art inspired by the psychedelic visionary experience. Outsider Art may refer to art that is created outside the boundaries of an official culture. Every Outsider Artist has their own story. Some made art in prisons or mental institutions or worked as a janitor by day and created a silver foil throne room in their garage at night. All artists must practice and are ultimately self taught although some are influenced by their personal history and environment more than the history of art. Most "outsider artists" are compelled by a spirit or vision to create. It can be raw and expressive because it's innocent from the "business of art." My work has been placed in each of these categories. My work is currently included in exhibitions at both the extraordinary American Visionary Art Museum in Baltimore AND at Halle de St. Pierre, the Paris home of Outsider Art. When we see the Visionary Arts Fair in Athens we can comment on it's uniqueness and similarity to other offerings. I was lucky enough to hear your lecture when you came to Atlanta last year. Can you give us a taste of what you'll be bringing, or discussing, when you come to Athens? Alex: In Athens I will offer an illustrated overview of Sacramental Culture and the Entheogeneration, sometimes called the Love Tribe. Festivals all over the world attract visionary artists from many disciplines including dance, music, costume and jewelry design as well as painting and sculpture. Burning Man is well known for celebrating what we also call the Tribal Revival that is springing up all over the world. 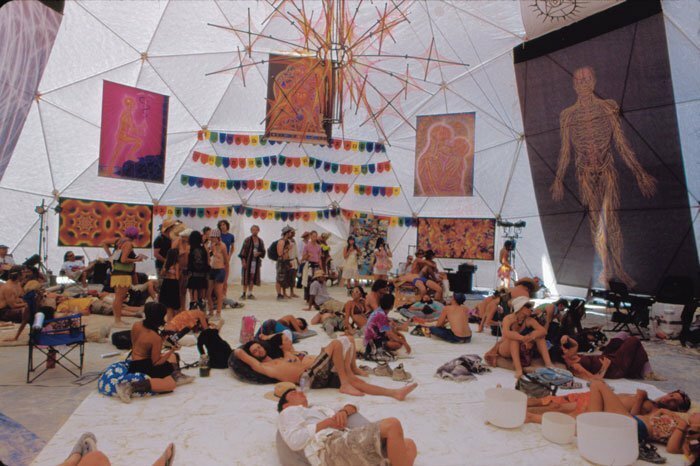 Burners enjoying Allyson Grey and Alex Grey art reproductions on display at Entheon Village, Black Rock City. You often speak about the connection between art and the evolution of human consciousness. Could you briefly explain for readers not familiar with your works? Alex: The evolution of human consciousness is etched into the history of art. Shifts throughout art history appear in phases that are magical to mythic to rational to transcendental. Works of art can literalize states of being and provide a new view in order to transcend it. A depressed person who pictorializes their despair can externalize their inner world and can get a new perspective on their state of being, possibly facilitating a resolution to their depression. Alex: My body of work. Co-founding the Chapel of Sacred Mirrors with Allyson. Thirty-eight years of a truly great marriage. Our exquisite daughter. When I hear that my artwork resonates with the personal peak experiences of others. Having been widely published and well recognized, what advice would you have for an aspiring local artist? Alex: Keep a journal and draw everyday. The Mission of Art and my other books, the classes Allyson and I teach together at Omega Institute and at CoSM are filled with information useful to aspiring artists. Be inspired by your life in order to create the most uplifting and thought provoking artworks. Be uncompromising in your study of technique that will support your art and study philosophy and great thinkers to make your work come from a deep place.